Part 2 here. Part 3 here. Part 4 here. The first big snowstorm came through a couple of days before Charlie & I were due to travel to St. Louis to hear Michael Bush speak. I got a bit nervous but the road crews did a great job. The drive was a nice, easy one. Not so much finding the actual place in St. Louis. Ahem. You might say we got a tiny bit lost and got to see a good part of the city — and not the best parts, either. Good thing we left early! The speech? Conference? Lecture? Whatever it was started promptly-ish at noon and we were thrilled to see Russ there, another beekeeper from our local MVBA club. I took copious notes, even though all of the presentations are on Michael Bush’s site. I’m a dork like that. After his presentation, there was a “swarm panel” of three fellas. Michael Bush talked a bit more about his methods. Another fella (yellow shirt with the beard) talked about his cutouts, trap outs, and swarm captures. (MVBAers, he seemed very much like our own Paul with his stories!) The third man, on the right, showed us his take on a swarm lure box he built. It was a small nuc-ish like box with a frame of old comb and a couple more frames with foundation, with a bit of lemongrass essential oil. At the top of the thing was an extension through which he had drilled a hole. That hole is big enough that he can saw off the end of a sturdy limb and slip that sucker right over, to await a swarm. Pretty cool stuff. He said, in one location, he’d caught four swarms last year. In another location, nothing. A followup email stated that there were 190 in attendance. How cool is that? BeeSpeakSTL.com is a new series and I’m thrilled to have been able to attend the premier event. 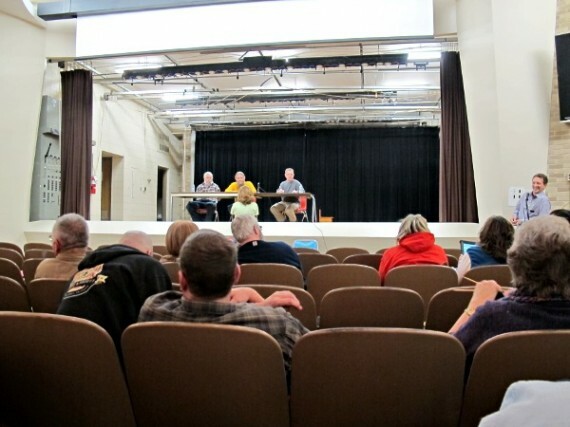 They said they’d try to put on three to four events each year, focusing on “unconventional, thought-provoking” info that you won’t normally find at your local, neighborhood bee clubs. They’re scheduling an as-yet-unannounced speaker for the May-June time frame and will have Kim Flottum on October 12. Alrighty. Time to dig into my notes and give you the rundown of Michael’s main presentation. I’ll post appropriate links from his website as I can find them. If you haven’t already, I definitely recommend spending a few hours reading through his website: The Practical Beekeeper. As I’ve mentioned before, I bought his book last year and it’s now my favorite beekeeping resource. You can find the same info on his website for free but I like the way the book is arranged much better. Pricey but very worth it for me. (All presentations are provided (in PowerPoint) on his website here: Look on the left sidebar at this link.) Warning: I have internalized his info and am spitting it back out here thoroughly Diane-ified and in quick & dirty format. If you want to hear a smart person tell you, in full, you’d best go to the source. The ecology of the hive is incredibly diverse, with gazillions of insects and microorganisms. Some of these organisms are beneficial, some are detrimental, and some are just “taking up space” but still important to the balance. Balance — that’s a huge, huge thing. When one little thing is disrupted, it affects many (most?) others. Many of the currently accepted treatments, deemed as “not harmful”, do indeed disrupt the hive’s ecology, even “innocent” alternative treatments such as essential oils and organic acids. It doesn’t take much to start killing off the biofilm in the gut of the bees which makes them much more susceptible to pathogens and disease. Treating bees/hives breeds for weak bees and strong pathogens. Only the most virulent and prolific pathogens & insects survive. It also keeps the combs full of chemicals. Most beekeepers use foundation and those have recycled wax from mostly conventional beekeepers. So, already contaminated wax to start with, then topping that off with more treatments that most beekeepers use, and on and on. Wax is like a sponge and the chemical load in it is ever increasing. (Organic acids do not build up, however.) This insecticide-laden wax, even at low levels, becomes part of the bee’s homes. They live in it. They store their food in it. They raise their brood in it. And it affects sterility & fertility and longevity. These treatments, both chemical and essential oils, interfere with the bees’ communication. Yes, even the much-loved Honey Bee Healthy. (Smoke also interferes with this communication but only lasts for 15-20 minutes.) Bees communicate through smell and vibration. Put odd things in there that don’t normally belong and you start screwing things up. Smell is how the bees know where the queen is. Smell is how the bees know when brood needs fed. Smell is part of how the bees find the location of nectar sources. And so on. Getting the idea? The downsides of not treating? Some hives will die — but some hives will die anyway. Michael Bush says good riddance to bad germs and welcome to good, strong genes. To make up for hive losses, you can make late splits and overwinter to cover your losses. (Michael Bush only loses hives to winter now, not really anything else.) Hives die. That’s part of life. Advantages of not treating? You save money on treatments and time on back & forth for treatments. You end up with pure, uncontaminated wax. You don’t upset the ecosystem, keeping the natural balance. Mites and bees learn to live in balance and the bees breed to survive the normal, natural challenges. Shipped queens are often superseded. In order for the full development of the queens’ ovarioles, she must lay or 2-3 weeks. She can then take a break and not have any problems. However, most shipped queens are put in a cage (a forced break) well before then and she suffers from arrested ovariole development. The bees sense this and supersede often. Longer-lived queens also help the hive develop good supersedure skills. When you artificially requeen a hive, the bees never get to the point of sensing a need to supersede — and you’re throwing in a strange queen with the issues noted above. Let the hive requeen and you save yourself work and the hive gets to do so at the optimal time. If you must requeen yourself, you can do so with your own queen cells. Advantages of breeding locals? It’s cheaper and you can have nucs with queens banked for whenever needed. It contributes to the overall genetic diversity. (Shipped bees can often come from a very small genetic pool.) It’s easy to just put in a brood frame or queen frame from a nuc. The pheromones are good and the queen is easily accepted. Purchased queens, much more difficult to get the bees to accept her. Wow, you could hold your OWN conference! Sounds like you really got a lot out of the trip! 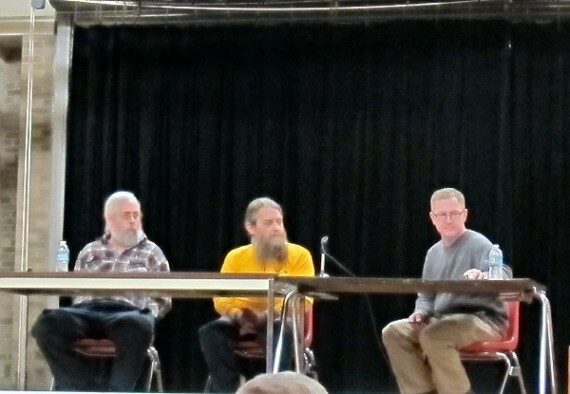 When the panel spoke about treatment free, did they say how they felt about powder sugar dusting for varroa mites? I don’t use any “chemicals” or essential oils, but I have powder sugar dusted. I wonder how disruptive that can be? I’ve wonder if it makes it hard for the bees to breath for a period of time and then they’ve got to stop and clean everything up?? Ya know, I thought of that very question during the presentation but they asked us to hold our questions until the end… and I forgot to ask. Doh. That was my one burning question, too. I’ll be at the Dadant anniversary as well. Hope to see you there!